The term eating disorder refers to disturbances in eating that is accompanied by emotional and physical distress. Official classification of eating disorders includes three conditions: anorexia nervosa, bulimia nervosa and binge eating disorder. 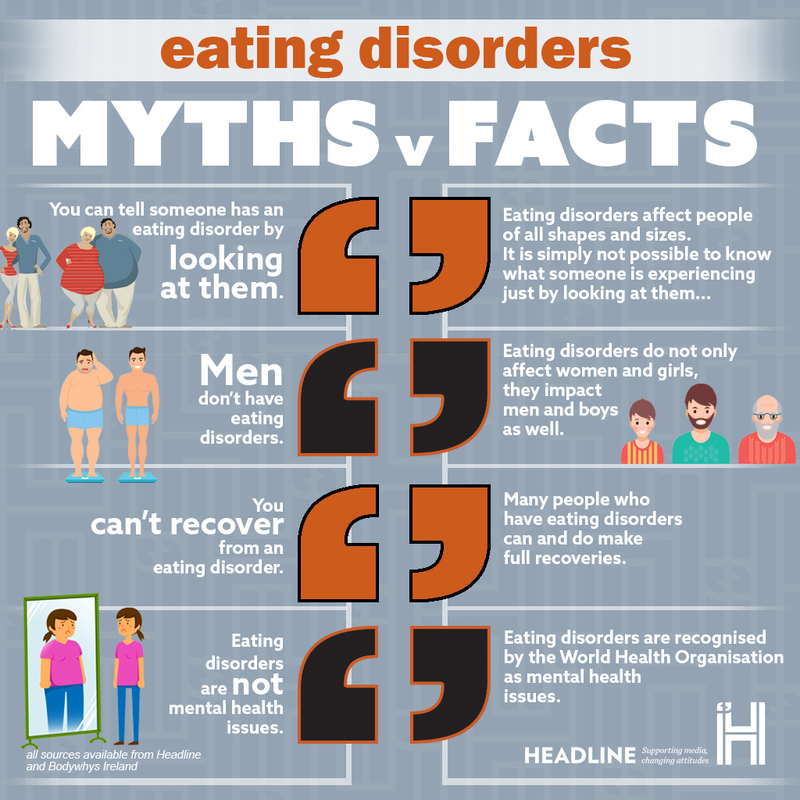 In this section you will find advice for covering eating disorders, common myths and facts, and definitions of the various kinds of eating disorders people experience. Always include contact details for further sources of information and advice when reporting on eating disorders. Bodywhys – the Eating Disorders Association of Ireland. An eating disorder is a mental illness with serious physical and psychological implications, which can be life-threatening. As such, eating disorders should not be portrayed as a choice, phase or ‘extreme diet’. Whether it’s 30 pounds gained or 60 pounds lost, or 3000 calories consumed, an over-emphasis on numbers can be particularly triggering for a person affected by an eating disorder or for someone who may be at risk of developing an eating disorder. Avoid specific details about behaviours engaged in by any one individual, as it can isolate others affected by eating disorders by suggesting that their experience is less valid. These details may also inadvertently provide readers with new ideas as to how, for example, they might restrict their own food intake. This can be triggering for those affected by an eating disorder, and for those at risk of developing an eating disorder, as it may be seen as an ideal to strive for. The word anorexic and bulimic should not be used to describe a person e.g. “Mary is an anorexic”. That implies Mary is defined by her anorexia. The preferred description would be ‘Mary has anorexia', ‘Peter has bulimia’ etc. Eating disorders can affect everyone of any age, gender, or social class. References to typical profiles can create feelings of exclusion. The use of scare tactics and sensational headlines in the discussion of eating disorders is unhelpful, as it creates an atmosphere of fear around the long term health implications, while at the same time trivialising the experiences of those affected by eating disorders. Take care when reporting “celebrity” stories. If you intend to use celebrity stories, it is important to put these into perspective. It is also important to be aware of the dangers of sensationalising and glamorising eating disorders through the use of such stories. While eating disorders are very serious conditions, recovery is possible with the right support and treatment. It is vital that this message of hope be communicated in any media work around the issue of eating disorders. You can also use a report about eating disorders to dispel some common myths about the condition. You can find some examples of myths and facts on this page. Anorexia is a condition where an individual weighs at least 15% less than the usual healthy weight expected for their height. It is characterised by a limited intake of food, issues with body image, and a fear of being overweight. This can result in symptoms such as irregular periods in women and girls, constipation, depression, and osteoporosis. Bulimia involves frequent dieting and exercise followed by purging or using laxatives. Individuals with bulimia may be underweight, overweight, or average weight. They can experience an inflamed throat, swollen neck and jaw glands, kidney problems, or severe dehydration. This condition features episodes of binge eating during which the person consumes large quantaties of food in a short period of time. Unlike with bulimia, people experiencing Binge Eating Disorder do not purge or use laxatives following a period of binge eating. Other aspects of the condition include eating rapidly, feeling uncomfortably full, and experiencing guilt or embarrassment. Headline is Ireland’s national programme for responsible reporting, and representation of mental illness and suicide. Our objective is to work as collaboratively as possible with Irish media professionals across print, broadcast, and online platforms to reduce the effects of suicide contagion, and the stigma attached to mental ill health.